Tootsie, an Assistance Dog for the Ministry, was matched with Pastor Stephanie Smith of Cathedral in the Night in October 2017. Since that time, she’s made quite an impact on the Northampton, MA congregation. Pastor Smith continues the story. 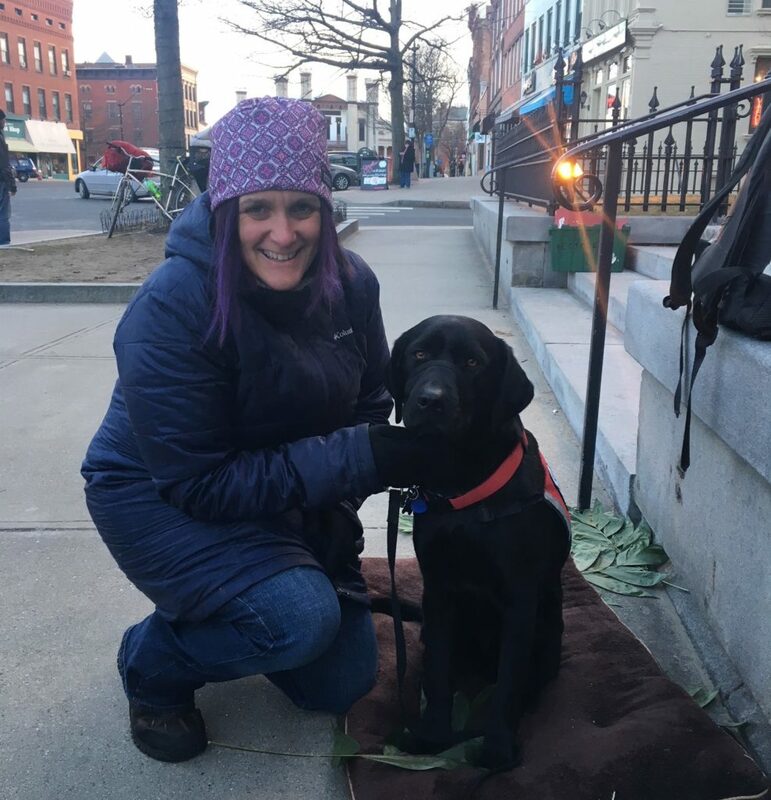 Cathedral in the Night is out-of-the-box – literally, as we don’t have a building, and we worship each week outside on Main Street in Northampton, Massachusetts, and Tootsie is an out-of-the-box way to share love and healing and facilitate connection. Many of the members of our church are experiencing homelessness, poverty, mental illness, and addiction, as well as overcoming great trauma. So we gather each week to create a welcoming community and share a warm meal together. Tootsie is a wiggly embodiment of unconditional, non-judgmental love. When people see her coming, no matter what they are struggling with, they start to smile, and stress and frustration fall away, if only for a moment, as they bend down to snuggle with her. Tootsie helps people relax and open up. She makes them feel safe and playful – two things that are not easy to come by for most. She isn’t afraid to get close. Even when people are putting up walls to protect themselves, Tootsie gentle nudges through and shows them they are lovable and worthy. When my words fall short and don’t break through, her sweet eyes and playful spirit can slip through the smallest cracks and open up a moment of love and connection. There are days when people are at their breaking point and their behavior pushes them away from others, and that’s when Tootsie shines. She sees them as they are, and when others would back up, she leans in. She brings a sense of calm and quietness to their spirit and helps them stay connected. I want to share with you what Tootsie means to one of our members. On Sundays I get to handle Tootsie during church. I used to come to church early and set up, but I couldn’t do that anymore. I couldn’t lift anymore. I couldn’t stand for more than 20 minutes at a time. I had nothing left to do to help. Then Tootsie arrived. Now, when I get to church, Tootsie is excited to see me. Pastor Steph and I bring her to the side yard before the service and play fetch with her and let others come play with her. During the service, I sit with Tootsie. During the passing of the peace, everyone comes to say hi to Tootsie, and sometimes to me, too. When folks are lining up for dinner, Tootsie and I greet each person as they pass through the line. Tootsie shows me so much love and seems to sense when I need extra love. Because I’m so involved in the church, I’m fortunate to see Tootsie several times throughout the week. This is just one person’s experience with Tootsie, but the words ring true for so many. Many of our members feel like they are always takers – always in need with nothing to offer. Tootsie is just one way they can see that they have something to offer as well. Tootsie needs them and loves them just as they are! 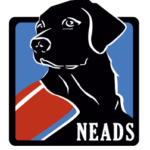 Tootsie spends time on the street corner, at coffee shops, and at yoga classes I teach at the Northampton Recovery Center where prisoners attend (some of whom have worked with NEADS dogs in the past), in the most painful moments and the most joyful.